Through the work of students, faculty, and new president, Anthony Monaco, Tufts University hosted Mayor Thomas M. Menino to talk about his vision for a healthier Boston. The mayor drew his listeners in by alluding to his “jumbo-sized food agenda.” He pointed out three “food groups” that guide Boston’s comprehensive food policy: accessible and reasonably priced fresh food; a healthier city; and the food economy. One of the mayor’s first initiatives in office was to bring supermarkets to low-income neighborhoods in Boston, which he has successfully accomplished. Twenty-five supermarkets have been opened throughout the city. Even more importantly, Boston has strived to increase food accessibility to people of all incomes, largely through projects such as Bounty Bucks. Bounty Bucks is a program that doubles the dollars available to food stamp recipients, and all 25 of the supermarkets opened in Boston accept Bounty Bucks. At Food Day, Mayor Menino shared his vision for healthier children throughout Boston. With 40% of children in the Boston Public Schools being overweight or obese, the mayor fought for taking soda and junk food out of the schools. “My biggest political fight was when we took the soda machines out of the schools,” the mayor said. The turning point came when his six-year old grandson told him the food at school tasted like cardboard. “When your grandkids come to you, you get to work,” he said. Though he had many parents and teachers against him, Menino succeeded in reducing access to junk food in schools. He said that since then research has shown that kids drink less soda now than they did when it was sold in the schools. Boston has also recently seen sugary beverages removed from city buildings. 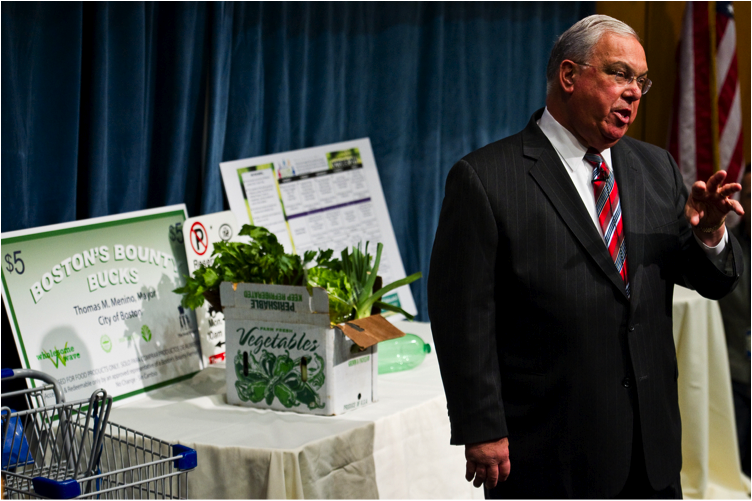 “We will see people making healthier choices because the options that are immediately available are healthier,” said Menino. Boston’s food economy was the last “food group” of discussion. Menino mentioned the restaurant industry and acknowledged the good that they do for the community. Many restaurants support non-profit organizations in Boston, and several chefs donate their time to events such as cooking demonstrations. It wouldn’t be Food Day without mentioning the 40 food trucks scattered throughout the city. Menino was partial to Clover Food Truck’s BLT sandwich. He reminded everyone that these food trucks also “serve up jobs, with 3 to 5 people per truck.” Clover alone has grown from seven employees to 70 since they opened in Boston. Finally, Mayor Menino did not forget the root of all things food – agriculture. He referenced his own CSA as well as farmers’ markets and community gardens that exist throughout Boston. “Bringing supermarkets and farmers’ markets into neighborhoods brings fresh food into our neighborhoods, gives people access to healthy food, gives people long and healthy lives, and helps create jobs,” Menino said. The mayor also sponsors the city-wide annual food drive, Boston CAN Share. The funds raised support the Bounty Bucks program, and the cans go to The Greater Boston Food Bank. Mayor Menino closed by emphasizing the importance of educating the young children in the city. He challenged the Tufts community to work together with others in Boston towards nutritious food for our communities. Lainey is a first year Nutrition Communication student. She enjoys running, rock climbing, and traveling to the South. She hopes to help people have a positive relationship with food. When not doing school work, she enjoys selling jewelry through her business at Stella and Dot – www.stelladot.com/laineyyounkin.